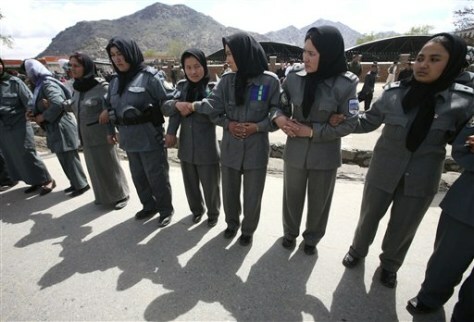 Afghan female police officers create a barrier for Shiite counter protesters during a march in Kabul on Wednesday. The group of some 1,000 Afghans swarmed a demonstration by 300 women protesting against a new conservative marriage law. Some men pelted the women with stones as police struggled to keep the groups apart.